Birmingham, nicknamed "The Magic City" due to its industrial growth in the late 1800's and early 1900's, is a county seat and the largest metropolitan area in the state of Alabama with a population of more than 212,000. Iron and steel production built the city. And although manufacturing remains an important component of the Birmingham economy (several major U.S. steel producers have plants in Birmingham), it has been largely overshadowed by the growth in financial and service industries including banking, insurance, telecommunications, health care, and college education. 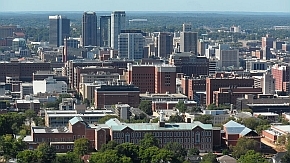 Birmingham plays host to the headquarters of 5 Fortune 100 companies, and one Fortune 500 (Regions Financial Corporation). Whether you’re factory floor or management, find what you need in Birmingham. From package handlers with UPS to RN Case Managers with UAB Health System, job opportunities are alive and well in The Magic City. Additional information on the local economy and key employers... Wikipedia: Birmingham Economy.